Velocity Makes Good on Promise at “Flashes of Brilliance"
Some people see improvisation as a frightening medium—where too much creativity is required. 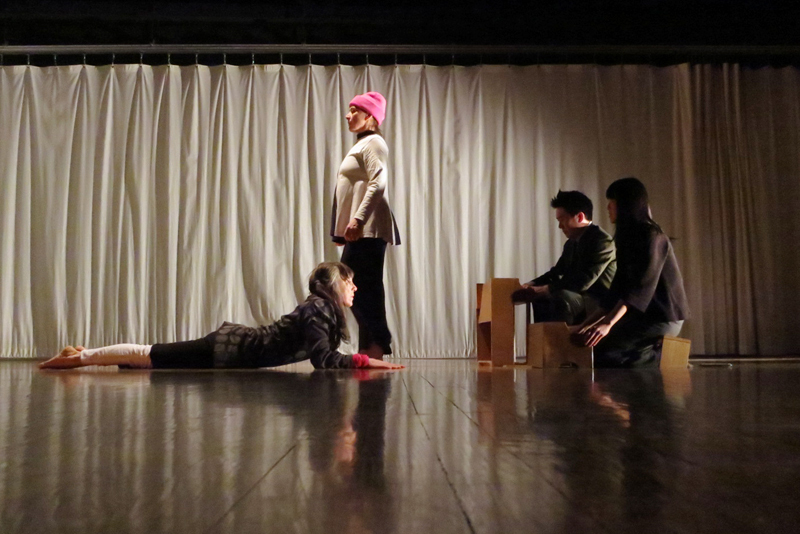 Some consider improv to be an effective way of generating choreographic ideas. 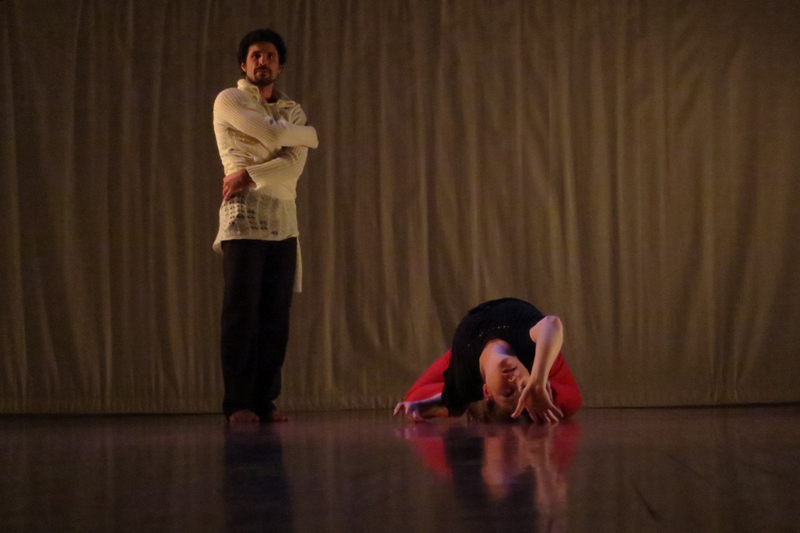 Others still consider improvisational movement to be its own art form. No matter what, it cannot be argued that improv dance allows audiences to find the beauty and spontaneity in pure, unadulterated movement—to see flashes of brilliance. Velocity presented just that on Saturday, February 11, 2012 at “Flashes of Brilliance,” their Seattle Festival of Dance Improvisation benefit concert. In this evening of improvised movement, light, and sound, 21 artists came together to create seven short “impromptu” works. The artists were paired up in groups; some chose to all perform on stage, others kept the designers and musicians behind the scenes. While it is nearly impossible to create perfection throughout an entire improvised work, the presenters were able to create wonderful structural developments in their works. The moments where everything fell into place perfectly were—for lack of a better word—brilliant. In “The Ancestors of Amy Michele Reeber-Meade, Lena Kwan Simon, and Aaron York Swartzman, would like to request your presence in the celebration of Nonimaginary, on February 11, 2012 at Velocity Dance Center. RSVP.” (hereafter called, simply, Nonimaginary), dancers Aaron Swartzman and Amelia Reeber, musician Lena Simon, and lighting designer Dave Proscia started on stage together, using voice to create a sound track. Swartzman and Reeber’s movement duet began a bit rocky, but built in energy at their first contact. They came together, Swartzman lying on his back and Reeber leaning into him, and they scooted across the floor in this position; from here the work became so cohesive between all four artists, it was hard to tell it was improvised. Nonimaginary ended beautifully as well, with the lights coming down to highlight Reeber staring into the upstage curtain. Swartman gave the audience one last surprise as he joined her at the curtain, but ended looking at her, instead of into the blank white canvas. Douglas Ridings presented an interesting character study with help from Stephen Fandrich (prepared piano) and Proscia. Ridings, covered in white body paint, entered the performance space hunched over. The contrast between Ridings’ repeated stomping and gesticulating and Fandrich’s pizzicato piano was tied together by dramatic pools of light, isolating the dancer from the viewers. Ridings suddenly screamed and ended the dance in a mesmerizing descent into the floor, and madness. Stephanie Skura joined percussionist Adam Kozie and lighting designer David Verkade to create Slow Owls Shout South. There were some interesting rhythms created between Kozie’s drumming and Skura’s footwork. The piece centered around Skura’s spoken word—a listen into her internal dialogue—creating comedy, which worked at times, and aiding in creating the overall feel of a woman trying to get somewhere; however, it did not allow for many “ah ha” moments. So too, things fell somewhat short with Beth Graczyk, Angelina Baldoz, and Proscia’s collaboration. While Graczyk’s hyper-mobile legs and elegant stumbling were intriguing to watch, Baldoz had a unique melding of guitar, recorder, and voice, and Proscia’s lighting choices created a lovely environment on stage, the three never seemed to gel. Flashes of brilliance were again seen in the opposite person, a collaboration between movers Linda Austin and Karen Nelson, musicians Byron Au Yong and Tiffany Lin, and lighting designer Ilvs Strauss. Although the improvised movement was overly presentational at times, the musicians’ performance was outstanding, with both playing toy pianos, shifting about the stage, banging on the sides of their instruments, and finally picking up a kazoo and slide whistle at the end of the work. A violin player also joined in from the audience, although he was not listed in the program. Tiger, performed by Alia Swersky and musician Paris Hurley (lit by Strauss) was perhaps, choreographically, the most compelling work of the evening. Both Swersky and Hurley danced throughout the work, with Hurley adding deep resonating vocals at first, then later performing on violin. The dancers used their strong technical abilities while moving back and forth from upstage right to center stage. Swersky walked on all fours in a high rélevé, while Hurley arched back and sang wildly. The final work of the night was performed by Peggy Piacenza and Wade Madsen, with Beth Fleenor on clarinet. The ensemble performed a skit, talking about what they wanted to do for their improv. Piacenza taught Madsen a combination she wanted to use, Madsen couldn’t do it to her liking, so they tried something else. Not as “dancey” as it could have been, this work was still enjoyable. The artists lovingly poked fun at improv, showing how spending too much time trying to come up with some epic work can end up creating a bad piece. They paid homage to the earlier pieces of the evening where the presenters were true to their art form and let their minds go. The piece ended with Strauss yelling down from the light booth, “Hey, guys. Your time’s up.” and calling black out. Seattle Festival of Dance Improvisation, formerly run by Dance Arts Group, will be held at Velocity July 29 through August 5, 2012. More information on SFDI can be found at www.velocitydancecenter.org/program/sfdi/. Thanks for the in-depth review. In the spirit of spontaneity, violinist Tari Nelson-Zagar joined Tiffany, Linda, Karen, Ilvs and me in our set. Tari had appeared at intermission having come from the Seattle Improvised Music Festival. It was great to include her energy on the spur of the moment.